Here’s a pretty tech oriented post for those of you who have been using AU LAB for an audio unit host. For those of you using AU Lab – the new X code 3.2.5 update is now available – which includes an update in AU Lab to version 2.2. I did the update this weekend – and couldn’t get AU lab to work for the life of me. If you’re using a newer mac – you might have better luck – but I was unable to get audio routing to the channel and the program would crash when trying to open a new document. Based on the release notes I was able to see – the biggest update to the software was an automatic aggregate device configuration. Which I don’t really get as setting up an aggregate device in Audio MIDI set up is well documented. That may be the issue with the problems I had but in the meantime I had to go back and install the previous X code version over 3.2.5 to get a working version of AU Lab. Like I said – You may have better luck if your system is more up to date. 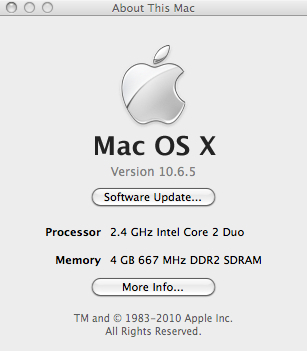 Here’s what I’m running (note: I running 32 bit instead of 64 bit). Re-installing AU lab is not as straight forward as you might think. There are probably multiple ways to do it – but this is what worked for me. While there are a series of paid subscriptions – you can sign up for the Apple Developer Program for free. This will give to access to previous versions of X code tools (which has AU lab as a component). Once you register and get to the login screen: Look for a screen called Downloads and Programmer Assets. Then look for Developer tools. If you scroll down you’ll see X code 3.2.2 Developer’s Tools – which has version 2.1 of AU Lab. The download will take a while. Just do the full install and it will replace the old files. While not a very elegant solution it is a functional one. This entry was posted in Gear, Guitar Tone, Laptop Guitar and tagged AU Lab, Au lab 2.2, laptop guitar, X Code 3.2.5 by GuitArchitecture. Bookmark the permalink.